Currently there are no events or updates to display. So.. What About the Mallard? Judging Waterfowl in the U.K. In January of 2008, I and Jane Edington of Maine had the distinct pleasure of judging waterfowl in the UK, specifically, in Wales. 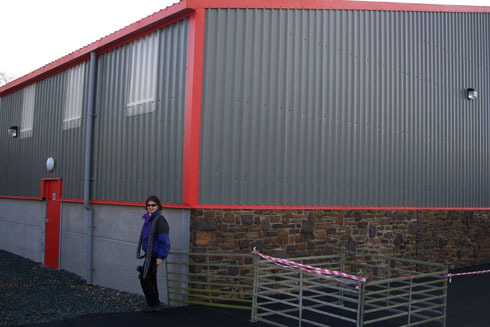 The Dyfed Poultry Club in Wales was celebrating the construction of a fine new building in Haverfordwest which is dedicated entirely to exhibition poultry. The building is owned by the Club and was made possible by a bequest from a founding member who passed away several years ago. The decision was made to hold two one day shows at the new building, the first to be a Call Meet and the second a show open to all types of poultry the following day. Jane and I judged the Calls on Saturday January 12 and judged some of the waterfowl at the show on the 13th. First, the facts about the meet: there were well over 400 Calls on exhibit which makes it one of the larger exhibits of Calls ever held in the UK. Every variety of Calls was welcome which meant that all 14 Standard colors and all 5 non-Standard colors recognized by the British Call Duck Club as well as some crested Calls shown in several colors could be exhibited. I judged the Standard Calls and Jane handled the non-Standard varieties. The largest single class was the Whites with over 60 on exhibit. The overall quality of the class was excellent as was the overall condition in which they were shown. Many birds were exceptionally strong in type points. In general, the size of the birds in the class was perhaps 10% larger than winning birds found at major shows in the U.S. and Canada but the heads and bodies were at least as strong in terms of type considerations. As a matter of fact, it was my impression from what I saw at this show that the average exhibitor in the UK may have a firmer grasp on the fine points of Call type than his/her counterpart in the U.S. At least there seemed to be fewer birds that were clearly out of place in competition. The Gray Call class (Mallard in the UK) was almost as large as the Whites. Again, the overall size of the birds was slightly larger than what is seen in the U.S. and Canada but again, type was strong throughout the class. Color faults were similar to what is commonly seen in North America with the exception of bill color in the males which was significantly cleaner, on average, in the UK. There was often mossiness in the color of the females and some weakness in color at the tail. Again, a fault quite common in the U.S. In the males, bibs were ragged at the bottom and a good number showed some cotton at the rump- which is consistent with what would be seen at U. S. shows. Strong birds cropped up with regularity in the other colors with well marked birds with good type being found in the Pied Mallard, Khaki, Blue Fawn, Black, and Apricot (Pastel in the U.S.) classes, among others. The British Call Duck Club recognizes a number of light or dark variations as separate varieties and good progress is being made with those. Surprisingly good crested Calls were on display in white and colored varieties. Champion Call was a beautiful White male and Reserve was a Mallard (Gray) male. The Call Meet was truly a pleasure to judge and meeting Call exhibitors from all over the UK were a highlight of the trip for me. 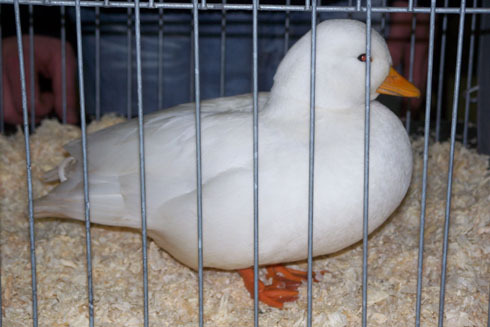 The following day, a general poultry show was held and waterfowl were well represented although the classes were neither as large nor as deep as the Call classes were the previous day. 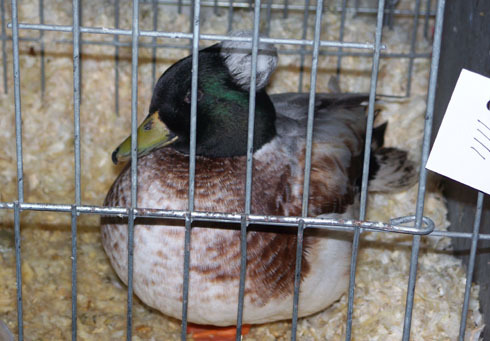 I judged the heavy ducks and was able to look over the rest of the waterfowl classes when I was finished judging. The Rouen class was small but the best bird was a world class drake in less than perfect condition. In good condition, that bird would have been competitive in any class of Rouens anywhere. He had the size, type, and color to win. The Muscovy class was perhaps the largest in the big ducks with several colors being well represented. While the best birds lacked the facial caruncling that would be sought in the U.S., they possessed wonderful size and many were in fine condition. There were also some competitive classes in the Saxonys and Silver Appleyards. There were many birds of high quality and undersized birds were not in evidence at all. Such birds would dominate their classes in the U.S. The Cayugas had excellent size and type but lacked somewhat in the fine points of color. The class that really caught my attention was the Pekin class. British Pekins are of a totally different type than those in the U.S. They are required to exhibit much more upright carriage than U.S. Pekins but many other aspects of the type are quite similar. Head points, relative width and length and tail features are very similar. The British require a more creamy cast to the color than we do and the emphasis on great size in the U.S. is not as apparent in the U.K. They are not willing to sacrifice type or head points to achieve great size as is often the case in the U.S. My friend Jane Edington arranged to obtain some English Pekins some time back and I can now understand her fascination with them. The last class of duck that left a deep impression on me was that of the Hook Bills. Still relatively rare in the U.S., Hook Bills are well represented in the U.K. in several colors. Their exaggerated curved bill and active nature make them very appealing. I must admit to one major disappointment; there were no outstanding Aylesburys on display which was surprising since the very best Aylesburys in the U.S. all are directly descended from English imports. I was also disappointed by the small class of geese. 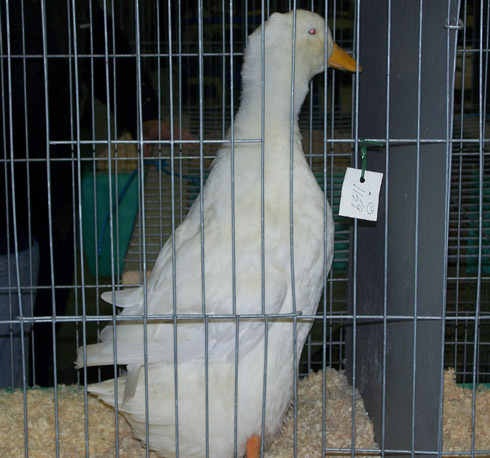 There were good examples of the Toulouse, Roman, and Czech breeds and a single Shetland goose of uncertain quality but not more than a dozen geese were present. 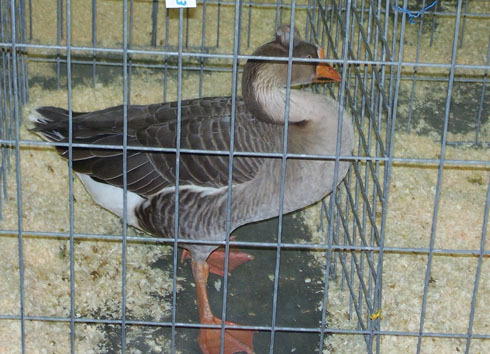 This Shetland Goose has Brown China type and color but sports a crest. I have always felt that American waterfowl breeders owe English breeders of past generations a vote of thanks for all the work they did on the development of many breeds of ducks and geese now popular in the U.S. and Canada. My visit to the Dyfed Show reaffirmed to me that waterfowl breeders of equal note are alive and well in the U.K. today.